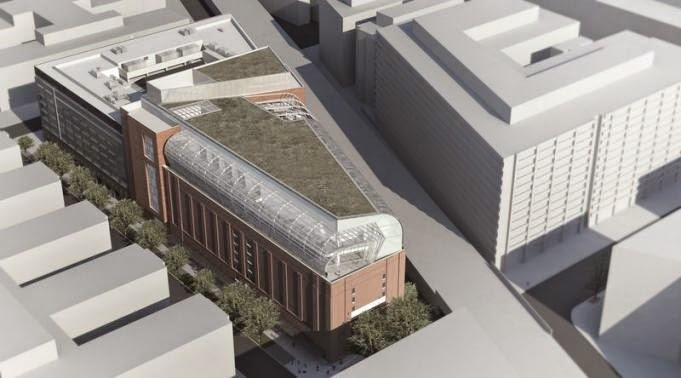 Construction was scheduled to begin this Fall on an eight-story, 430,000-square-foot Museum of the Bible in our nation's capital. The museum is the idea of Steven Green, CEO of Hobby Lobby, the Christian-oriented retail chain. The museum will be three blocks from the U.S. Capitol and its estimated cost is $800 million. It is planned to be completed in the Fall of 2017. The museum will contain the collection of Green himself, who has acquired rare Bibles, manuscripts, and related artifacts over the past five years. Green's acquisitions comprise "what is already considered the world's largest and most valuable collection of biblical artifacts in private hands." According to FOX News, the collection "includes such priceless prizes as several Dead Sea Scrolls, a portion of the Gutenberg Bible, the Codex Climaci Rescriptus, the largest portion of scripture in Palestinian Aramaic and the so-called 'Aitken Bible,' the first ever printed in the U.S." Also, there are "first editions of the King James Bible, several previously unpublished New Testament fragments on papyrus and some of the earliest known Jewish prayer books." As a modern facility, the Museum of the Bible will have interactive and handheld devices to provide a compelling experience for visitors. "A 'special Noah's Ark experience' for children and holograms and video screens that re-enact historical scenes related to the Bible" are among such state-of-the-art creations. "I think it will be extremely engaging and interactive," Green said. "We want to help tell that story so that it will be exciting for everyone that comes." There will also be exhibits that rotate on occasion. "Green has been having discussions with museums that have exhibits they would be interested in having at Museum of the Bible." Green specifically noted the draw that "celebrity Bibles" might have. He said, "I would imagine we will be able to have several famous people's Bibles on display and rotate some in and out from time to time... Our goal is to invite all people to engage with the Bible." Green originally planned to open his museum in Dallas, but then decided Washington, already presenting a rich variety of museums to draw tourists, would attract a greater number of visitors. We applaud Green's decision, which will hopefully benefit more than just the D.C. tourists. It is our prayer that, as it is shadowed by Capitol Hill, it will also minister to the lawmakers and other government leaders in the area, showing them that the Bible is a living document by a living God who can and should be consulted by prayer as they make decisions affecting our nation's future.